FROM the outside looking in, Kevin Reidy knew that last year’s Connacht Ladies Senior Club Football Final – and the replay that followed – were crackers. In the first instalment, Carnacon’s Cora Staunton scored 4-13 but the game still ended in a draw. At the second time of asking, late goals from Staunton and Amy Dowling broke Kilkerrin-Clonberne hearts, just as they seemed on the verge of a famous win. The expectation is that Carnacon and Kilkerrin/Clonberne could serve up another game for the ages, when they meet in Saturday’s provincial decider (Ballyhaunis, 3.30pm). And former Galway senior boss Reidy, who’s now guiding the fortunes of Kilkerrin/Clonberne, says: “I heard they were two cracking games last year and from that I read about them, if this one is half as good, it should be another great advertisement for Ladies Football. “You’ll have two very committed teams, as you have in every other province, going at each other for 60 minutes. The vastly-experienced Reidy, a postman based in Tuam, guided Kilkerrin-Clonberne to six-in-a-row in Galway this year. The club’s sights are now firmly set on winning a first Connacht crown since 2015, when they overwhelmed Leitrim’s Kiltubrid in the provincial showpiece. And while they were close last year, and Carnacon went on to lift the All-Ireland crown, Reidy won’t hear of “sad stories” as far as Kilkerrin-Clonberne are concerned. He says: “They still didn’t get over the line – that was the thing. “Carnacon went on to win the All-Ireland (but) I’m not a believer in sad stories. “You just have to get back at it again. We have a decent team but Carnacon are very, very strong as well. Reidy, who also took charge of the Tuam Stars minors this year (his home club), reveals that he had a number of approaches from men’s and ladies teams at the start of the year. 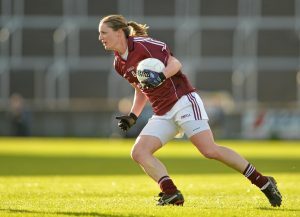 But when Kilkerrin-Clonberne stalwart Annette Clarke, Galway’s 2004 All-Ireland winning captain, contacted Reidy, he found the call difficult to ignore. Reidy says: “I was asked would I get involved with a few teams, both men and ladies this year. “I said no. Kilkerrin-Clonberne asked me as well and I said no. Annette Clarke made a call, I worked with ‘Clarkie’ and five or six more with Galway when I was there, and I said, ok, we’ll give this a go. “I’m enjoying it. They’re very dedicated and committed, no drama or anything with them, they’re a pleasure to work with. “In fairness, they didn’t dwell on last year. There was massive disappointment there, obviously, but you don’t hear players talking about it. “The Tuesday after any game, they don’t talk about the last game, they keep looking forward, in fairness to them. While Kilkerrin-Clonberne are serious contenders, Reidy acknowledges the strength of Carnacon, who are aiming for three-in-a-row in Connacht, following a series of off-field concerns. Reidy says: “In fairness, when everything was going on, it was nothing to do with us. “We just take it one game at a time ourselves, and that’s been our motto all year. Carnacon, the reigning Mayo, Connacht and All-Ireland champions, scored a 9-10 to 0-4 win against Knockmore in their recent county final, to book a safe passage through to the provincial decider – and another eagerly-anticipated clash with Kilkerrin-Clonberne.